Anyone who's been following the tours of major entertainment figures like Beyonce, Madonna and Nicki Minaj may already know that they’re wearing Chromat clothes on stage. What they might not have known—at least until recently—is that Chromat might be getting a little extra punch soon thanks to a new connection to Intel, turning the tour clothes of major celebrities into potent wearable tech platforms. The reports suggest that Intel will be supplying its Curie module for the clothing line, and giving Chromat's adrenaline dress some new features in the process. 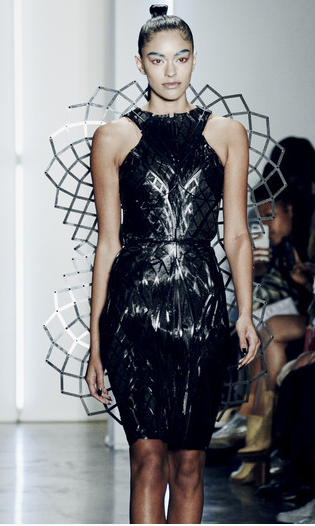 The adrenaline dress, as it's known, has a set of 3D-printed panels that respond to body chemistry. When heart rate increases, the dress goes into a fight-or-flight mode, and the garment's fibers expand to an hourglass shape. That wasn't all Chromat has in store, though, and further on tap is a sports bra that comes with adjustable vents that activate based on current body temperature. Essentially, as the wearer exercises, her body temperature increases. This is detected by the garment in question, which activates a series of vents that open as more ventilation is needed and close when the need is lost. But the technology is working to keep pace. It was just a couple weeks ago that we had a look at the issue of battery technology in wearable tech, and a study from Lux Research revealed that there was plenty of development push around improving battery technology for wearable devices. Indeed, making those batteries that are thin or flexible or even just small enough to fit readily into a piece of clothing can be difficult. No one wants to wear a shirt or a dress with a huge clunky plastic panel built into it—the typical standard of batteries today—so making batteries that can scale down is particularly important. Indeed, the Lux Research study suggested that the issue of battery size and life might even be holding back biological tech. The batteries that power a pacemaker tomorrow may well be powering a color-changing shirt later. Developing new batteries could be the key to unlocking several different advances in wearable tech, so while it may seem frivolous to get batteries sufficient to power a shape-shifting dress or a vented sports bra, that same technology might power a pacemaker next. Advances in wearable tech are likely to come hard and fast in the near future, so this is certainly a field worth watching.